In a second, life can go from smooth sailing to an urgent situation and catch you off guard. When you’re in the middle of a dental emergency in Irving, it can be difficult to think clearly and know what to do. Should you go to the emergency room or see your dentist? Is this something that needs immediate attention, or can it wait a while? In a lot of these situations, how you respond can make a huge difference in the outcome, so keep reading to know how to handle some dental emergencies and where to go to get the necessary treatment. For most dental emergencies, time can be precious and can determine whether certain treatments are successful. It’s important to know how to respond quickly and wisely in these situations. 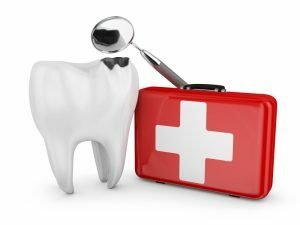 You need to contact your emergency dentist in Irving right away and get to their office as soon as you can, preferably within an hour. Do not touch the root of the tooth or remove any tissue that may still be attached to the root. Rinse it with warm water to clean it. If you can, try to place the tooth back in its socket. If that’s not possible, store the tooth in milk or water to keep the root moist. Your dentist can place the tooth, if you haven’t already, and a splint that will keep it in place while you heal. An abscess is a collection of pus that is caused by a bacterial infection. If left untreated, the infection can spread to your jaw and other parts of the body and can be potentially life threatening. An abscess may appear like a red or white bump on your gums and may be accompanied by a fever, tooth sensitivity to hot and cold, toothache, and swelling in the face. If it is especially severe, go to the emergency room. Otherwise, contact and see your dentist right away. If you suffer a toothache, contact your dentist for their next available appointment. It could be caused by tooth decay, in which case you could need root canal therapy, or an infection. Until you see the dentist, you can manage your pain with over-the-counter medication and cold compresses. In accidents where your jaw is fractured or dislocated, you need to go to the emergency room to ascertain the full extent of the damage and get the treatment you need to heal from your injuries. If you sustain severe face or mouth lacerations, you may likely need to visit the emergency room for immediate attention. Not all dental emergencies can be prevented, but you might be surprised by how many that can. By taking meticulous care of your teeth through brushing and flossing daily and visiting the dentist twice a year for cleanings and checkups, you can avoid serious complications down the road. These routine appointments with the dentist cost much less than a trip to the emergency room financially, physically, and emotionally. You can’t plan when or how a dental emergency will happen, but you can plan how you will respond when one does. By thinking ahead, you can make sure that you’re prepared and can act quickly and efficiently, helping ensure that your treatment can be successful. For more information about dental emergencies, contact your dentist. At 21st Century Dental, the compassionate, experienced dentists and staff do their utmost to accommodate either new or current patients with dental emergencies on the same day as their contact. With over 200 five-star reviews on Google, this practice delivers quality dental care with friendly, welcoming customer service. To schedule an appointment with them, call (972) 255-3712 or click here.